The first several hours of this day went well. A talk with a good friend, with progress made on some work-related decisions. Gorgeous weather outside, blue skies, sunshine, a breeze, and temperatures moderate enough for me to open the windows and patio door instead of having the air conditioner on. It feels wonderful outside. But this afternoon, as I started thinking about some things I need to do, and other things I’m trying to get clarity about, I started to feel the stress rise. I spent some time outside. And then I spent some time in front of the easel. I got out the canvas I started the other day (replacing the current one on the easel – I often paint on more than one project at a time). 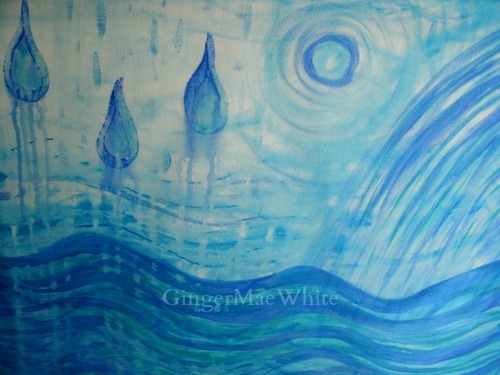 Using more blues, and using more water, I stood there and let myself get lost in the flow of the paint on the canvas. 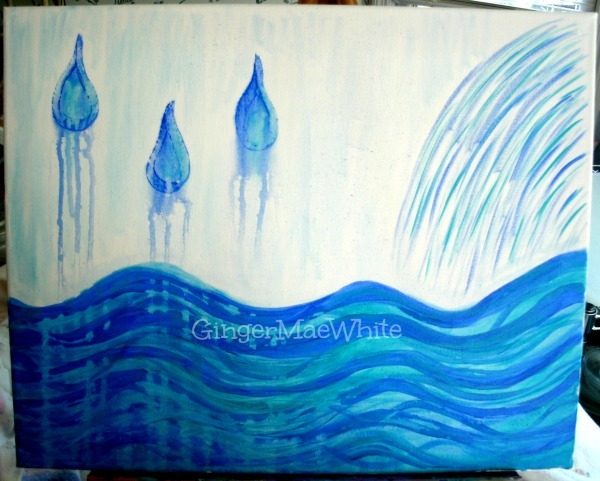 Letting my brush flow, letting the water flow, letting myself simply do swirls and curves and drips and drops. Not worrying about the end result. Only painting. Enjoying the doing of it. Connecting – again – to joy. As I wrote in my last post, I’m going to be blogging about joy for a while. Sharing something every day about my own personal journey to connect more deeply with joy. I’m starting this daily blogging about journey today on the new moon… a time of setting intentions, a time of starting something new. I plan to post every day for a complete moon cycle – maybe not always writing, there may be days where I post only a photograph or picture quote. But something – every day until the next new moon – that helps me stay connected to joy. Playing with paint has become a major joy-activating activity for me. I paint intuitively, not worrying about what the outcome will be, not planning in advance. And I connect with joy. This is the canvas on my table easel right now. The only thing I knew when I started – the only thing I know now – is I wanted to paint something connected to water, to flow. I’ve been playing with a few shades of blue and green acrylics, and adding water itself in some places to thin and spread and drip. This is only the start, what I did for a little while as I stood in front of the canvas and simply let myself play. I have no idea what this canvas will look like when it’s finished. The joy of doing it. Do you let yourself simply play and do things just because you enjoy them, letting go of worrying what others think or what the outcome might be? Just for the joy of doing it? I hope so… I truly believe it’s good for the soul.